How does you blasting burden influence your ground vibration? The burden of a blast is defined as the nearest relief to the borehole at the time that it fires. This can be either through a free face that the borehole was drilled near or a newly created face that was made from previous blastholes firing. Does this influence the ground vibration of a blast, and if so by how much? Well to answer this lets first dive back into the basics of rock blasting using the diagram below. 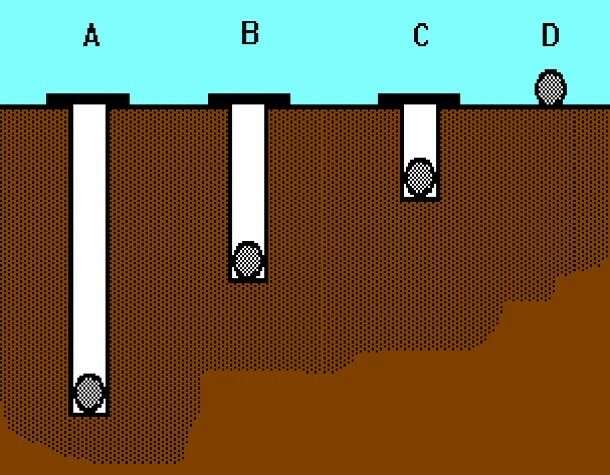 In this diagram each gray sphere is a charge of equal weight but different depth of burial. When we look at this we see that Charge A is an over-confined charge, Charges B and C are under normal confinement, and Charge D is an unconfined charge. We can then make a table such as the one shown below to show how the depth of burial changes how the explosive energy is used, understanding this is a conceptual model. Blast Burdens are the same thing as a blasts Confinement! This means that if we were to turn the diagram sideways and look at it instead of a depth of burial as a burden distance then we could see the affects of changing our burdens. As we reduce the burden, the ground vibration decreases. As the burden increases the ground vibration can increase – in rock blasting this increase in ground vibration from a totally confined blast can be as much as five times that of a normally confined charge. Therefore, if we want to reduce our ground vibration we can reduce our burdens. While many other considerations go into ground vibration this is one method that can be easily used. What other problems occur from reduced burdens? Want to learn more about Burden Design and Ground Vibration? View the 2015 version of Rock Blasting and Overbreak Control written by Professor Dr. Calvin J. Konya.